Invite searchers into your business with an indoor StreetView Tour directly from Google Search Results and Google Maps before they even find or visit your website. Tour-overlays can be built for new and existing Google Street View imagery, we can combine tours and include many interactive features and functions like Video, Audio, Book Now Buttons, More info, Ecommerce links, etc…. – see live examples below. HOW MUCH DOES A GOOGLE STREET VIEW BUSINESS TOUR COST? The 'Small Google Tour' is our minimum-cost service for a single location. This tour would cover a small inside space with maybe 1 or 2 external panos to show location. Although it's a small tour, it still has great value in helping to build-out your Google My Business listing and providing inside & outside 360 degree panoramic views of your business. The 'Medium Google Tour' of 6 to 8 panoramas would cover a small single-room inside space with maybe 1 or 2 external panos to show location. Typical use would be for a small cafe, retail or service business. It definitely has value in helping to build-out your Google My Business listing and providing a few inside & outside 360 degree panoramic views of your business. The 'Large Google Tour' of 9 to 15 panoramas would cover the inside of a slightly larger single-space or multiple-space business with maybe 1 or 2 external panos to show location. Typical use would be for a medium-sized cafe, retail or service business. It may also provide better ranking due to higher engagement time and allows potential customers to get totally familiar with your business through hi-quality 360 degree panoramic images. 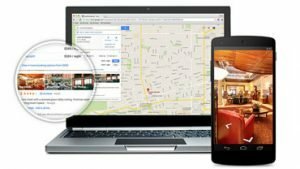 WHERE DO GOOGLE STREET VIEW BUSINESS TOURS DISPLAY IN SEARCH & MAPS? See example of Business Tour on Search Results display. *Note: ‘See inside’ thumbnail no longer available – all tour images will be available from ‘See photos‘ link. WHERE CAN I DISPLAY MY GOOGLE STREET VIEW BUSINESS TOUR? Any Google Street View Business Tour, starting from any point-of-view can be embedded with the ‘iframe’ embed code provided from Google Maps. There are no restrictions on the number of embeds or display impressions – your website, other websites, social media. You can also select to have Google provide you with a short-url, a printable QR code (for instant display on mobile devices) for any point-of-view link. These links can be shared on social media, email, other webpages and the QR codes can be displayed on print and signage. Businesses across the world are using Google Street View Trusted Photographers to achieve more search-prominence and user-engagement. 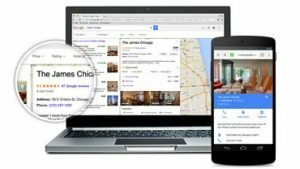 All Google Virtual Tours are displayed on Google Maps but need to be iframe embedded into websites to be of real marketing value. Our enhanced overlay embeds add a layer of engagement and functionality to the Google hosted imagery that builds this value even further. Same images - more functionality & marketing value. We can build overlays for any Google Virtual Tour - even the ones we haven't shot & published. Multiple tours, streetview images and privately hosted panoramas can all be brought together within the same user interface.